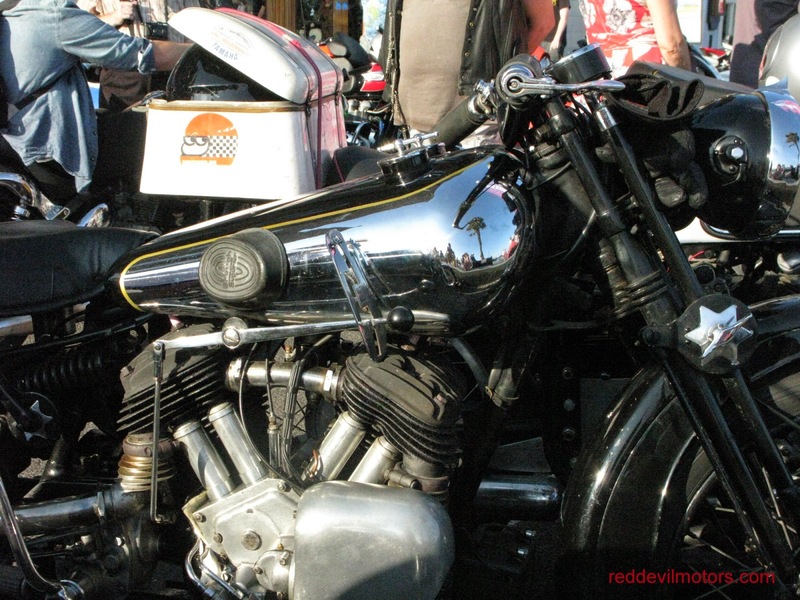 More pictures from Chimay Classic Bikes 2014. This time mostly of machinery to be seen in the paddock area. 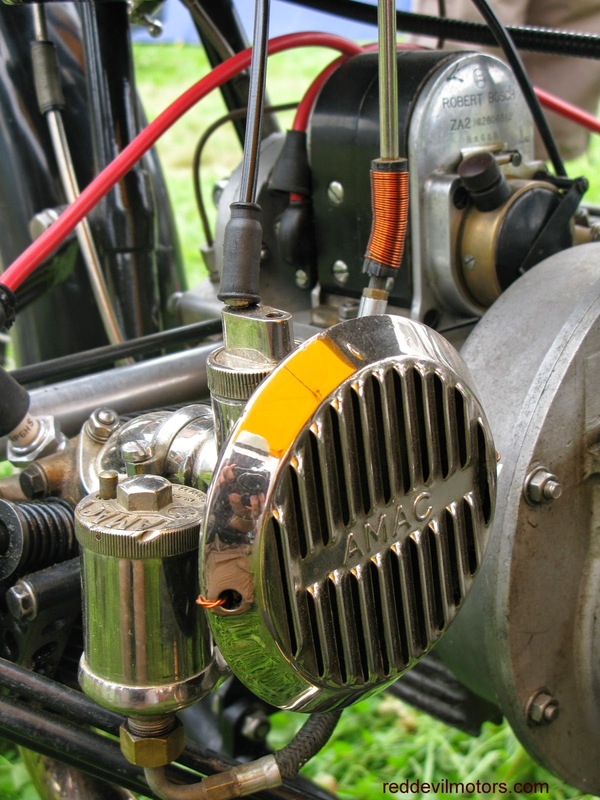 was developed from an outboard marine engine. seem unlikely. All the same it worked and worked well. 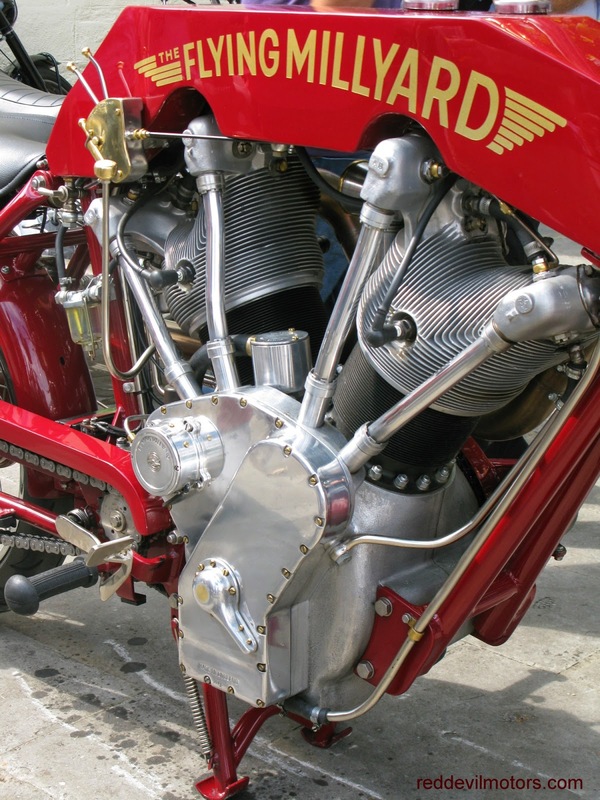 Detail on the Special Barthelemy. 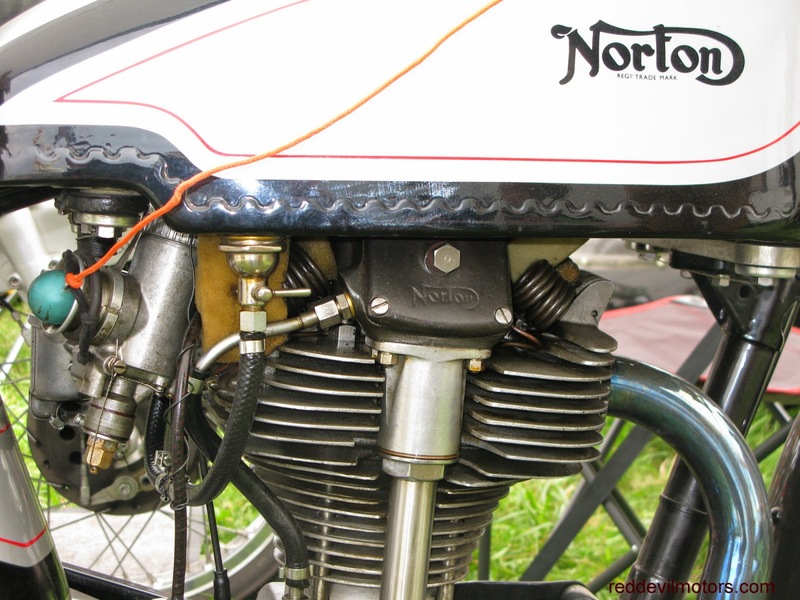 Norton 350cc 40M Manx with Manx Grand Prix history. 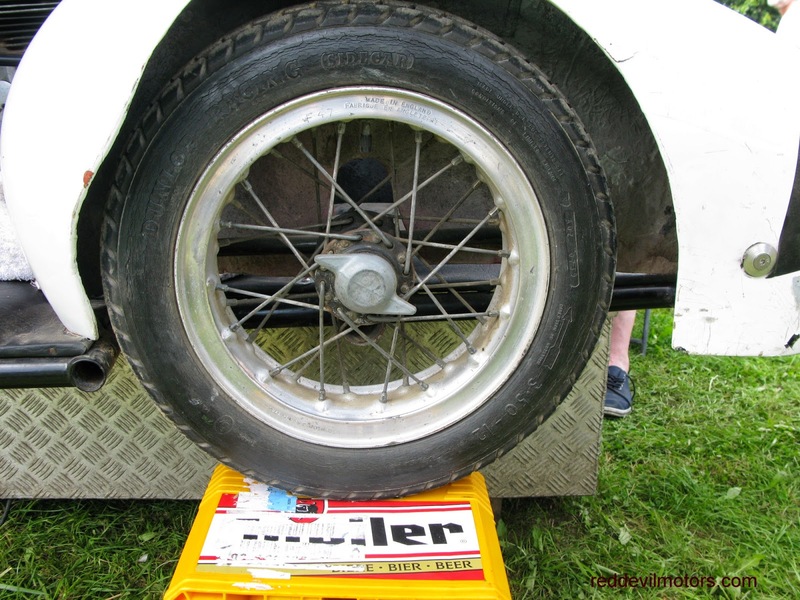 This novel use for a spare Beemer rocker box cover tickled me. 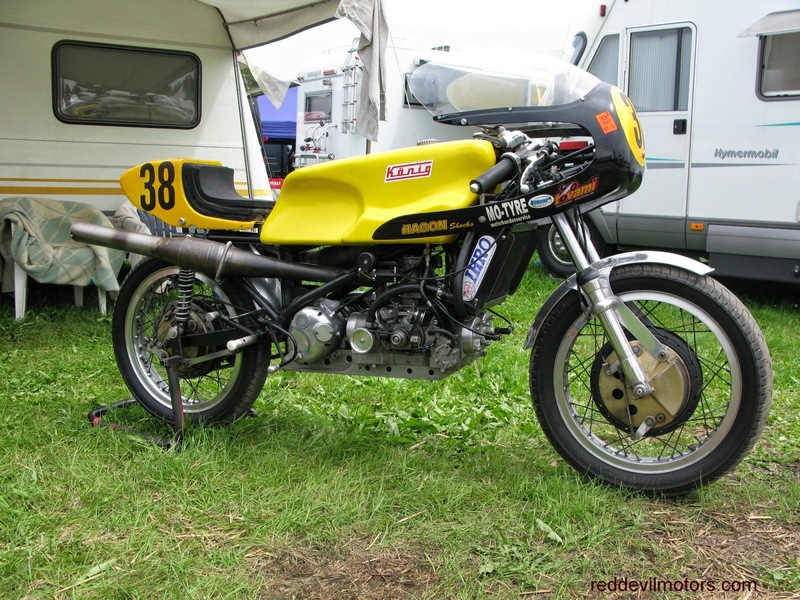 crew who raced a similar race tuned bike. day. It was still holding its own against a lot more trick machinery. 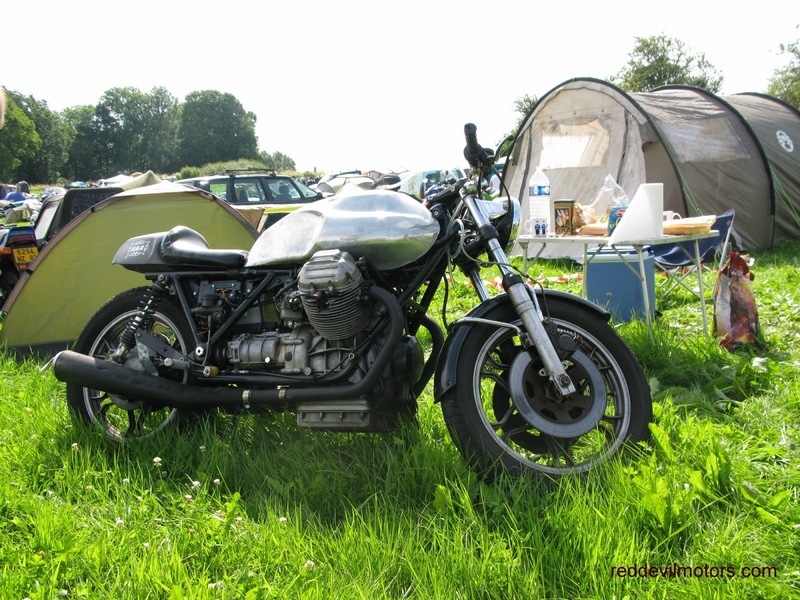 Smart Moto Guzzi Nuovo Falcone cafe racer in the campsite. 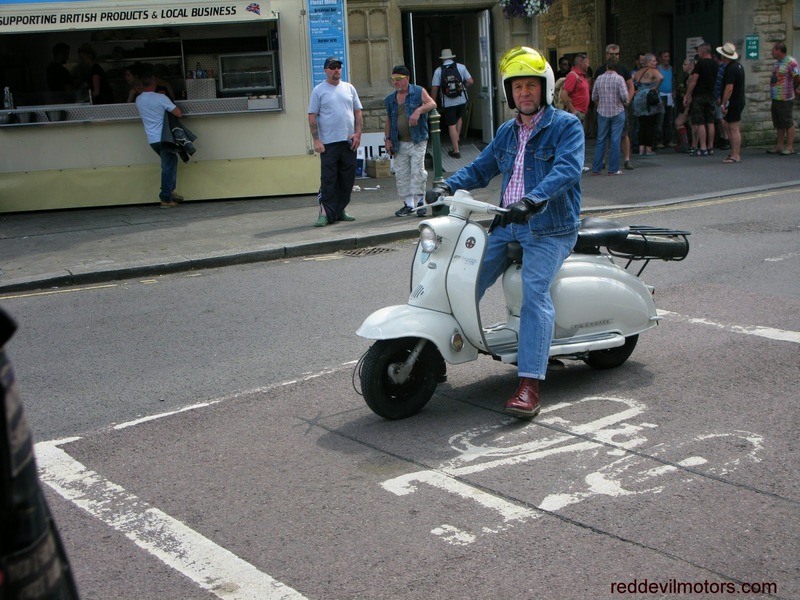 A quick drive up to Calne last Saturday. Not so many pictures taken as had a junior in tow still not convinced of the joy of two wheels and more interested in play parks and ice-creams.... All-the-same a few snaps of eye-catching machinery. ever needed to be restored I guess I would put it back to green. were the result. This is Sunbeam's offering. visor is a particularly nice touch. out together away from other bikes behind the shops. 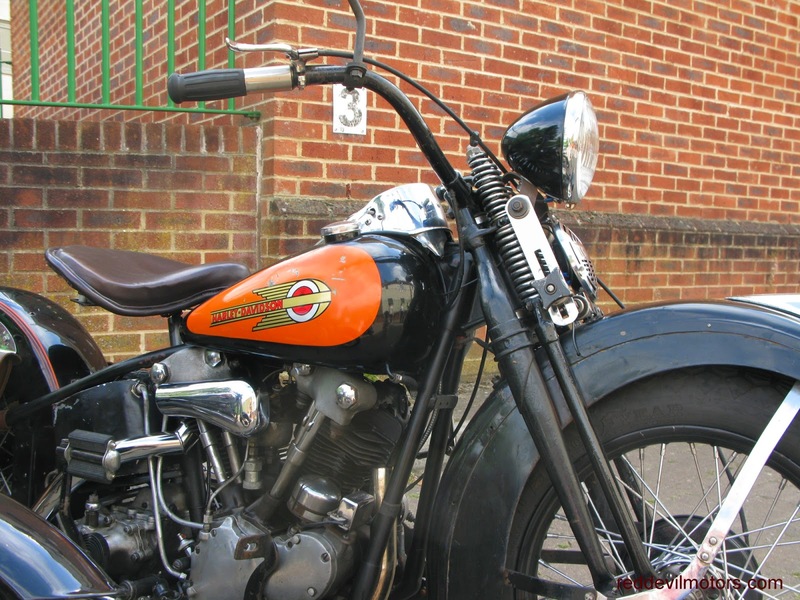 Knucklehead would have been the one. 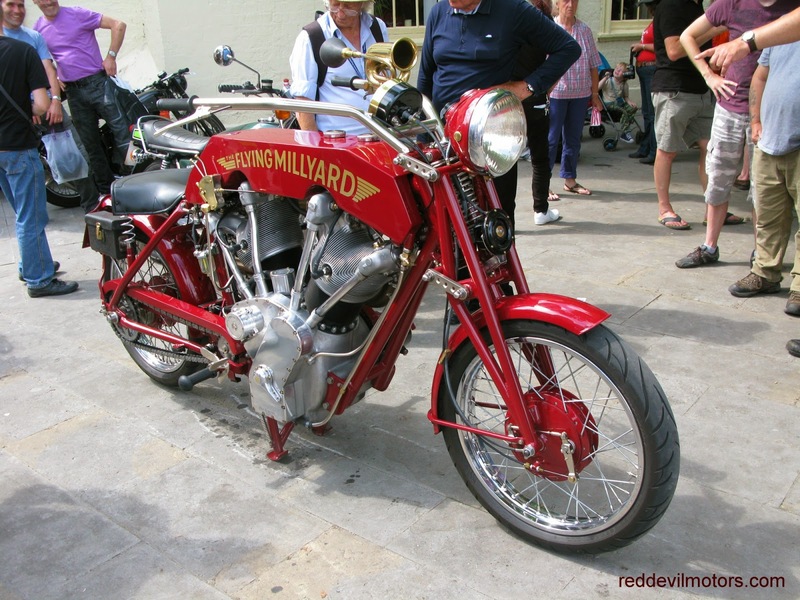 The amazing shed-built Flying Millyard attracted strong crowds. made bottom end. Search for it on youtube. It goes nicely! ﻿ ﻿﻿Chimay Classic Bikes has been on the wishlist for a few years now. 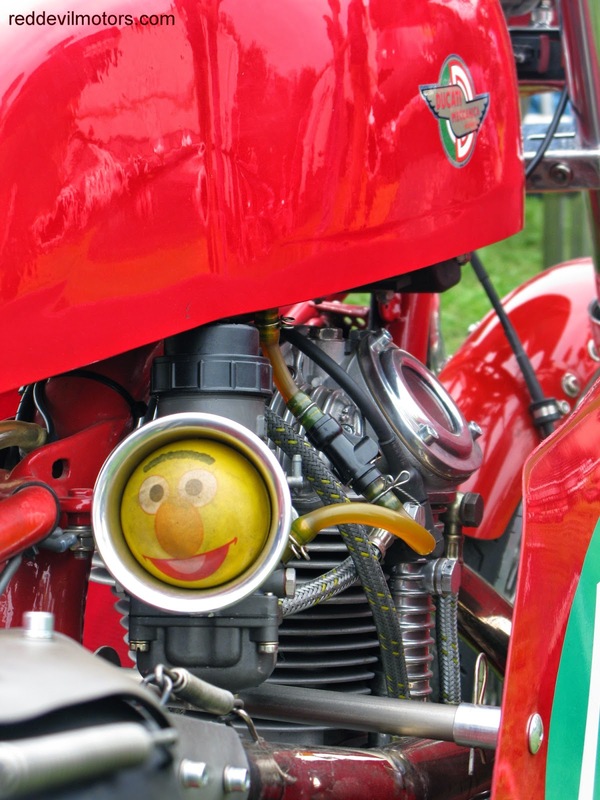 This year the cosmic bodies aligned favourably, time away from work and family arranged, bike fettled and all was set for five to go mad in Belgium. Arriving from several different parts of the coutry we rendezvoused in Folkestone the Thursday evening before the event to get on to the Eurotunnel early-ish the next morn. The lodging selected was the Wycliffe Hotel and pretty ideal it turned out to be. 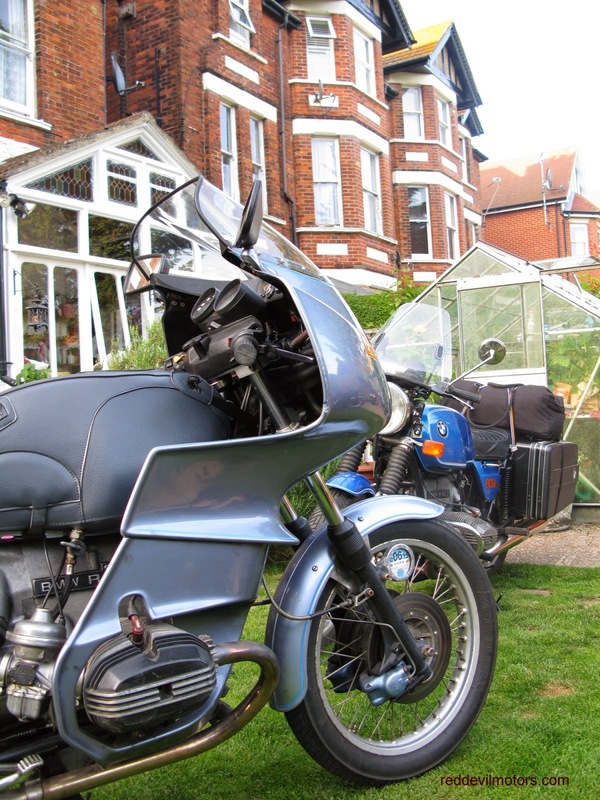 Old school bed and breakfast at £30 per person was fairly hard to beat and they let us put our bikes in the garden. The Beemer R100RS and I made it over from Dorset in about three hours, not bad for an old girl, and to our surprise were last there. 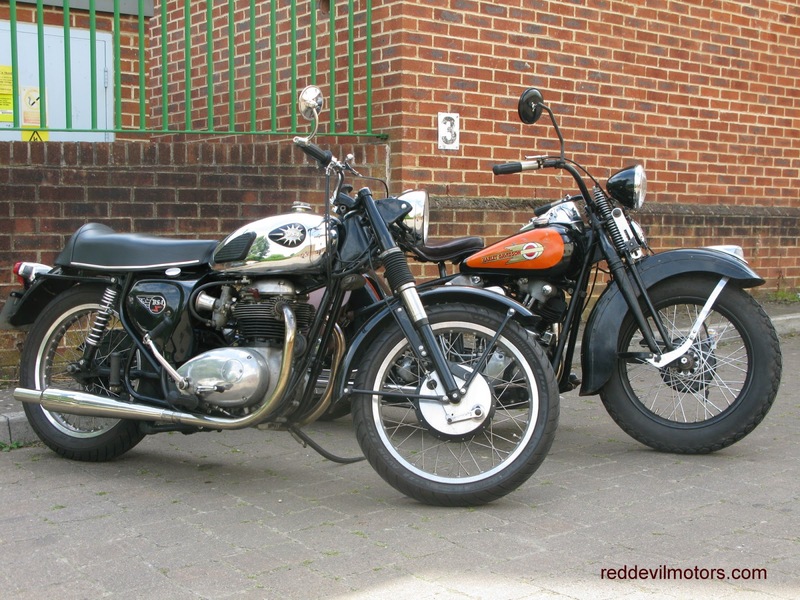 Rich and Matt had arrived an hour or so earlier with their respective Aprilia RSV Mille and Velocette Venom and Bill arrived separately but not far off on timing with a tidy BMW R80. 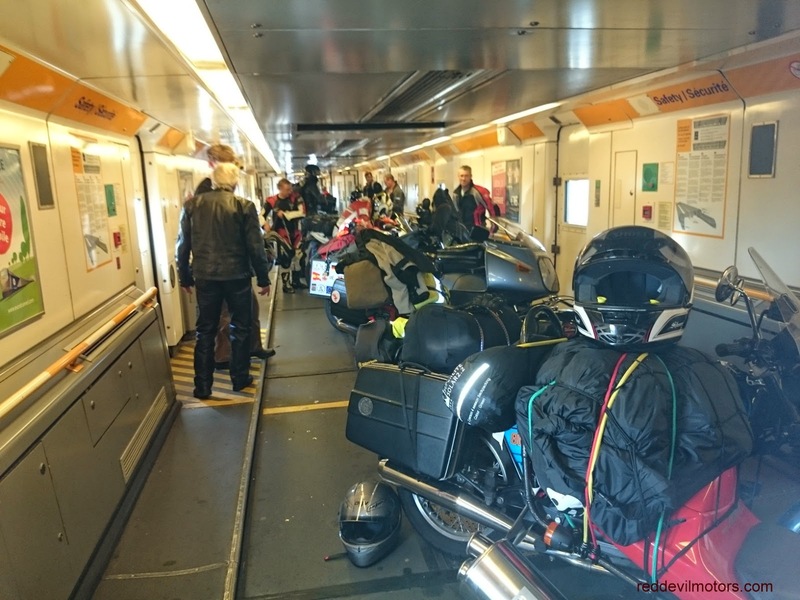 This was my first time on the Eurotunnel and I'm a convert. The price was just over a ferry crossing but the convenience way way above. The location of the terminal means that you don't have to ride through town and the loading is slick, meaning very little waiting time. 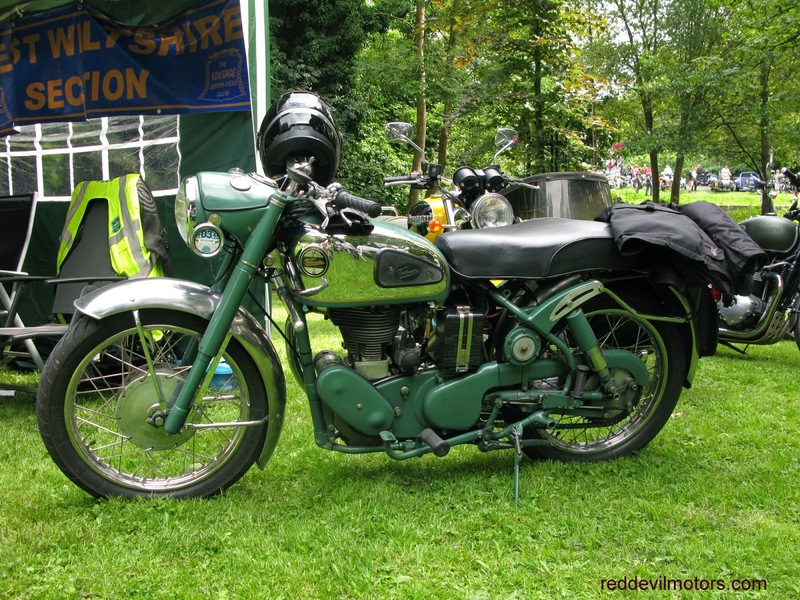 Once on board you just put your bike on the stand and hang around having a natter. 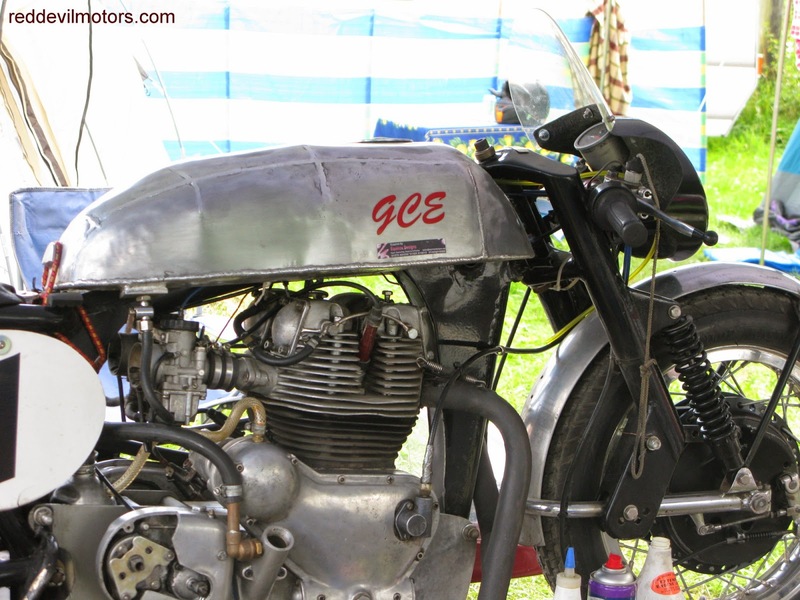 Acceleration and deceleration is gentle so no need for straps for the bikes or seats for the passengers. Half an hour or so later off you ride. 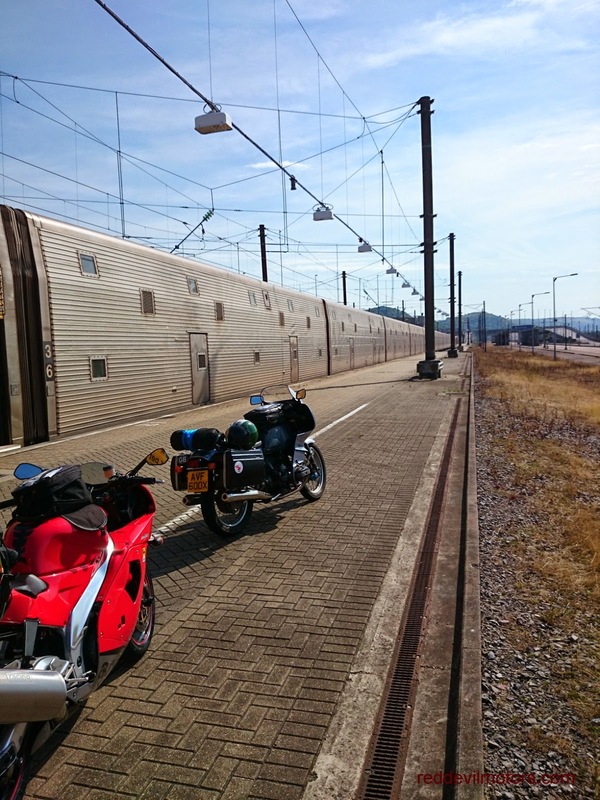 We met with Phil on his well travelled Kawasaki KZ1000 at the Eurotunnel terminal. Our route was plotted on the fly and on the train ride we got a tip to take the coast road from Calais down to Boulogne. The tip was a good 'un, the road and views magnificent. 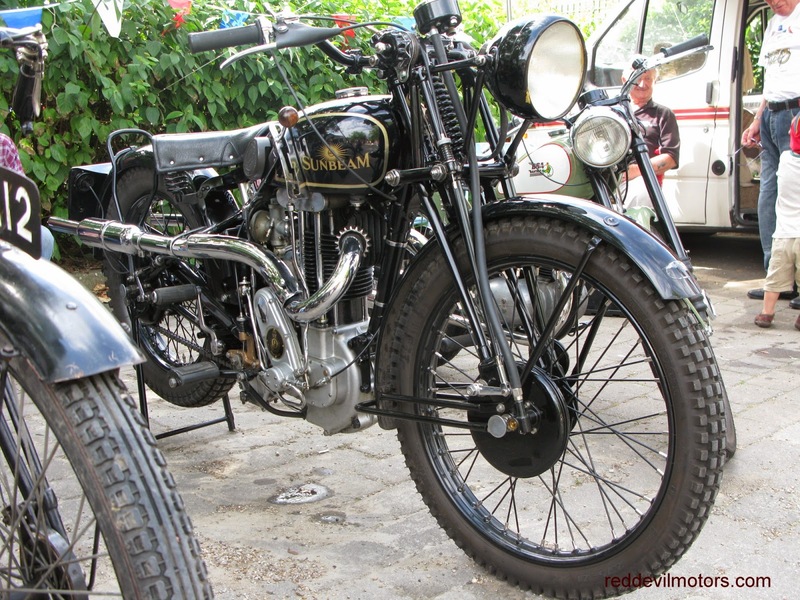 From Boulogne we plotted a route that took us along the smaller single carriageway roads. The quick route from Calais to Chimay is 150 miles so it could be do-able in just over two hours. Our route took us nine! Getting ready to board the Eurotunnel. 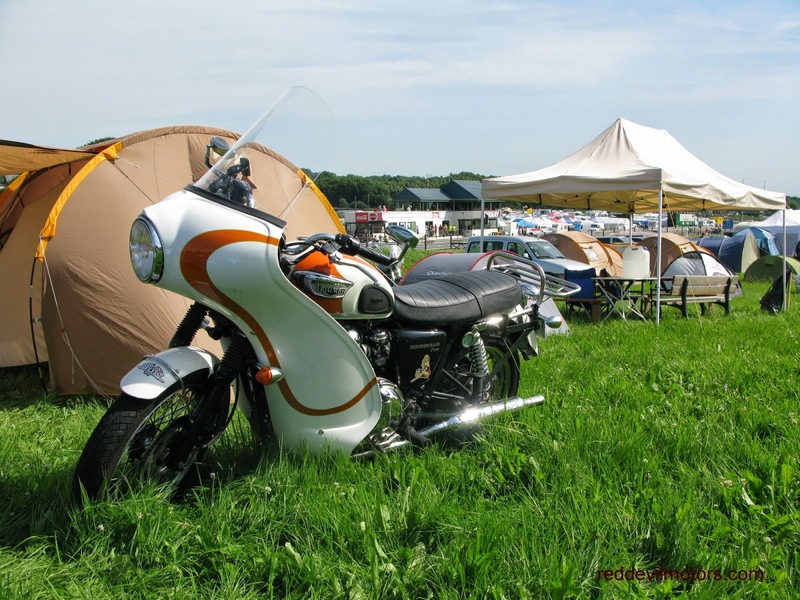 Camping at the circuit is included in the price of the weekend ticket. The campsite is on a slope and the only facilities are some portaloos. Not a big problem for a bunch of motorcyclists anticipating a weekend of racing and Belgian beer. Whilst the camping facilities were fine the eating less so. There was nothing open in the circuit on the Friday evening but the village of Chimay isn't far away so the two BMWs doubled up as pizza scooters and made a run in to town. On the subject of food at the circuit, best be said that the preferable option is prepare your own or eat in town, 'nuff said. Beer and music facilities on the other hand are excellent. ﻿More to come on Chimay very shortly. 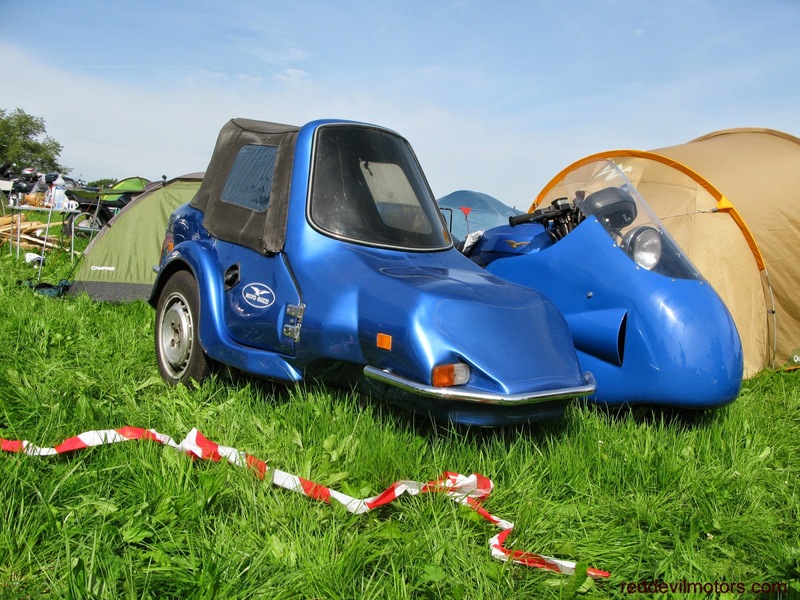 For the time being here're a few pictures of machinery spotted around the campsite. 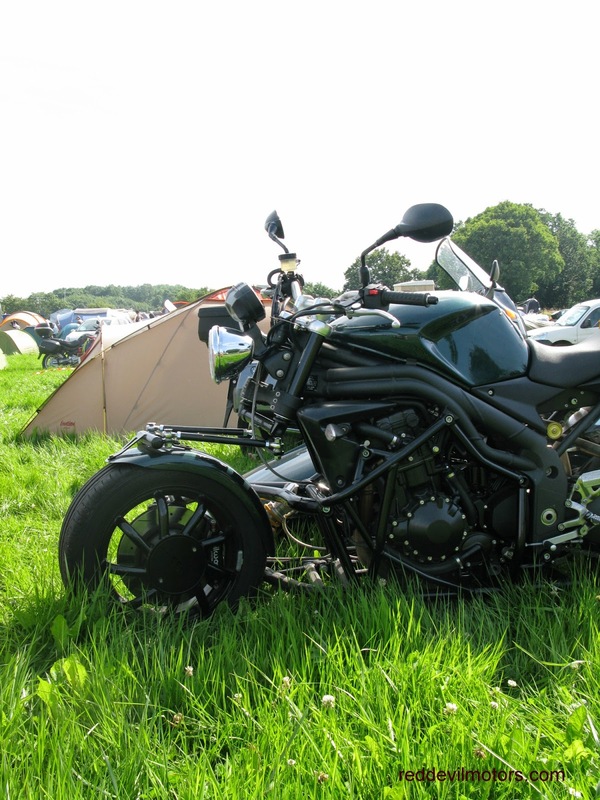 Hinckley Tiger 100 looked just right with a Dolphin fairing. 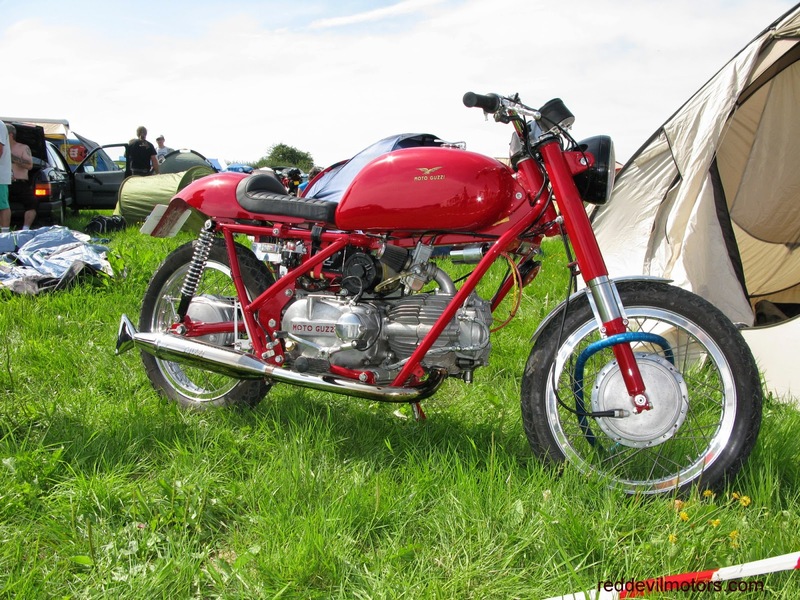 Guzzi Le Mans, Dustbin fairing and sidecar. great but we suspected it was Spada based. 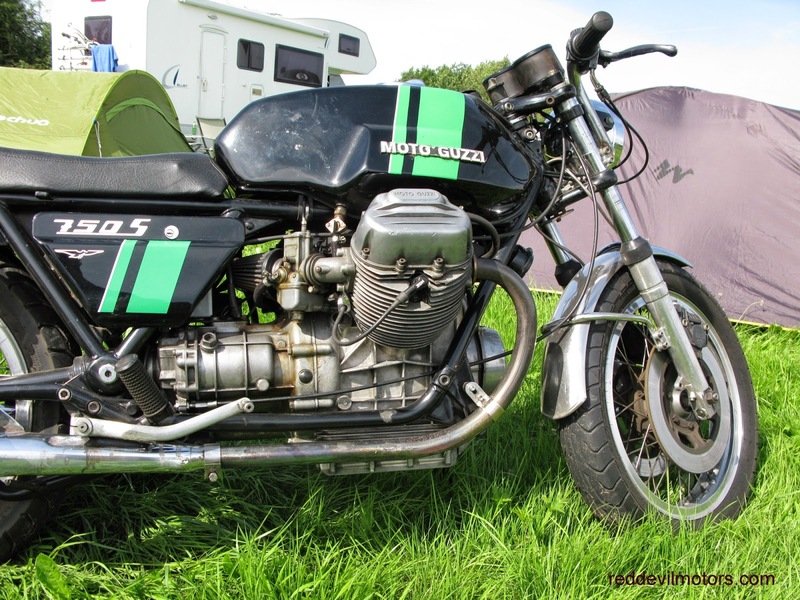 That same Guzzi from a different angle. were a few nice ones around. 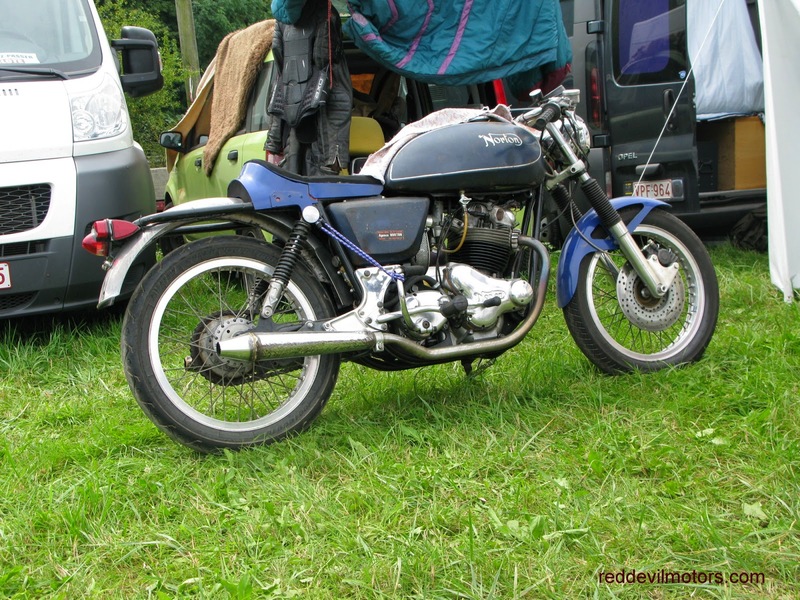 This is an original 750s. not sure of the exact date, certainly late twenties. 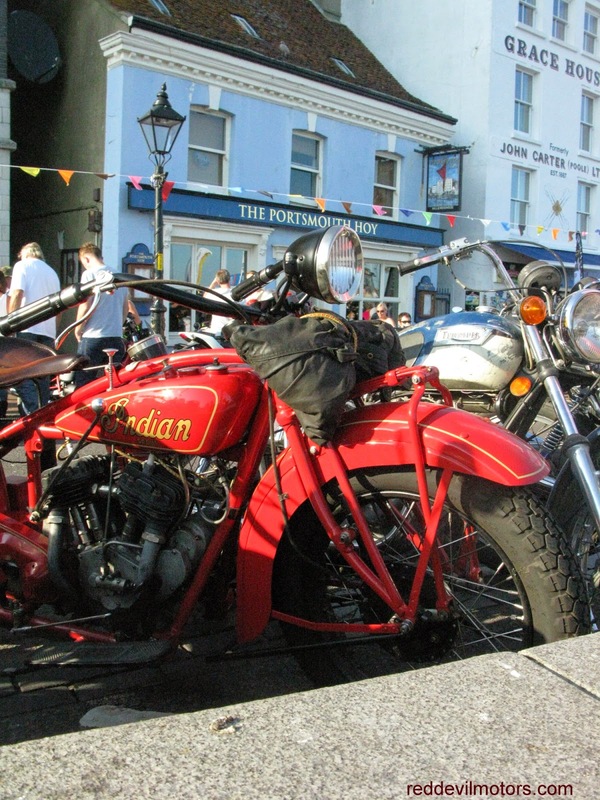 Great to see an Indian Scout out and about. condition. 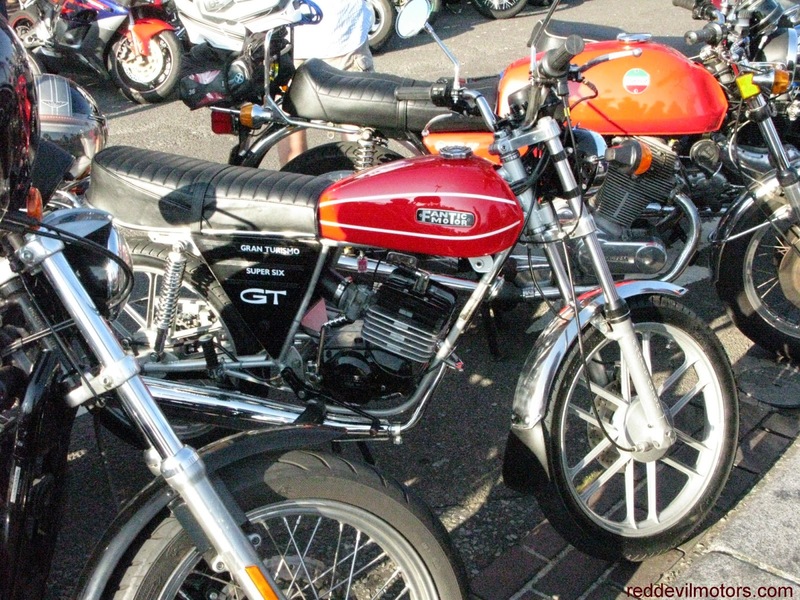 A Fantic GT Super Six from around 1977.
name it a Comdom Special rather than Norvin if you care to! 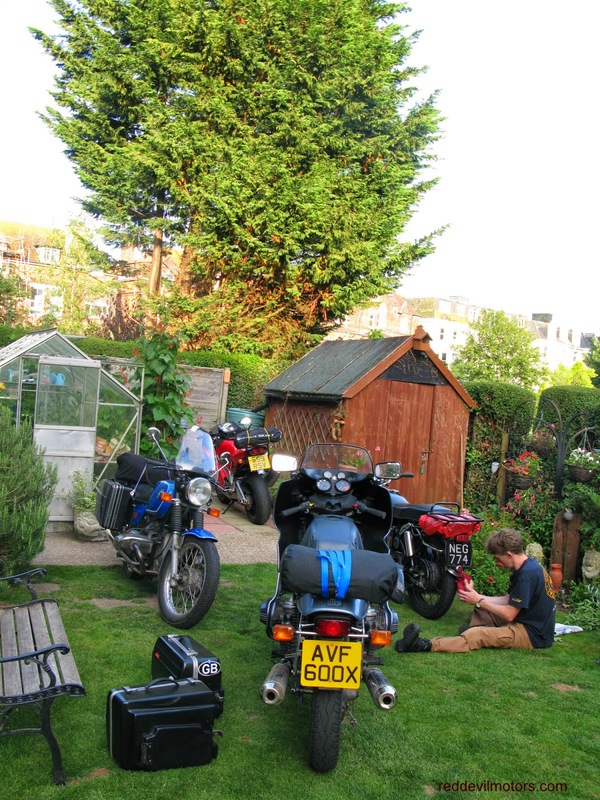 The BMW was given a quick canter yesterday evening to check it over before it goes to Chimay this coming weekend. 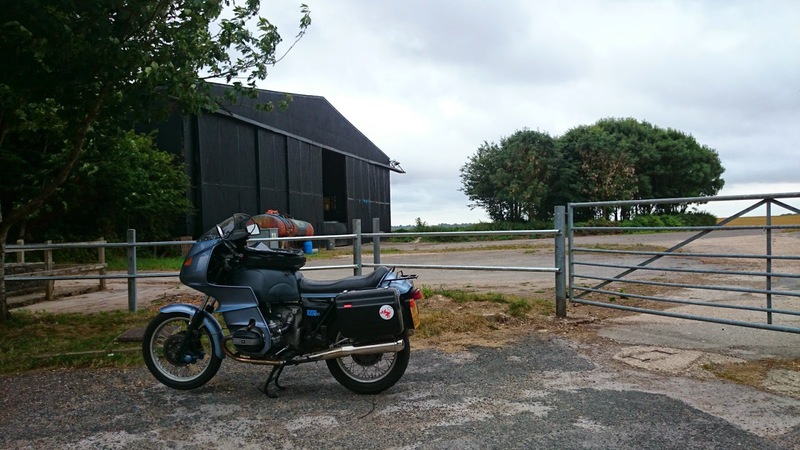 The route took me past Tarrant Rushton Airfield and I stopped for a quick snoop around (there's a bridleway runs nearby). 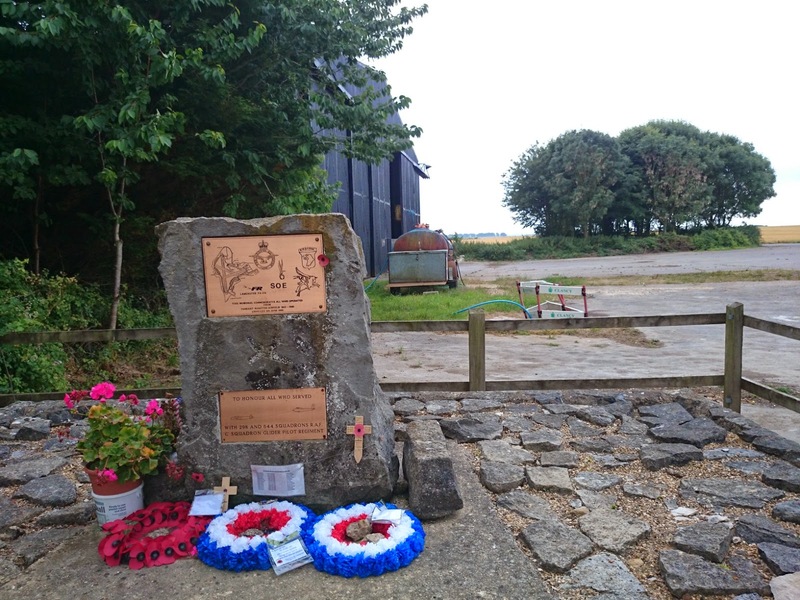 Work on the airfield began in 1942 and it came in to service in May 1943, slightly before it was actually finished. Gliders from Tarrant Rushton took part in both the Arnhem and D-Day operations. The airfield was taken out of service in 1946, but in 1948 Flight Refuelling moved in. Flight Refuelling became involved in the Berlin Airlift although it's not clear if sorties took off from Tarrant Rushton. Right through until the 1970s Tarrant Ruston was the home of Flight Refuelling; development work was carried out on new aircraft and conversions to existing RAF fleet were undertaken to make them suitable for in-flight fuelling. In the seventies Flight Refuelling moved to Hurn Airport, Tarrant Rushton was officially closed in 1980 and many of the buildings demolished immediately thereafter. Some of the runway still remains as does a hangar. 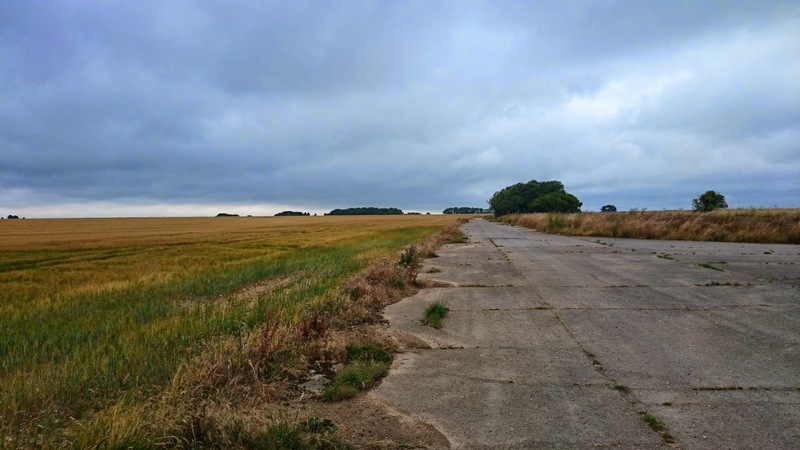 It's easy enough to get up close to have a nose around as a road runs close by and a bridlepath goes through the farm that now occupies the airfield. Memorial at Tarrant Rushton Aifield. The remaining hangar at Tarrant Rushton. Tarrant Rushton airstrip on a summers evening. 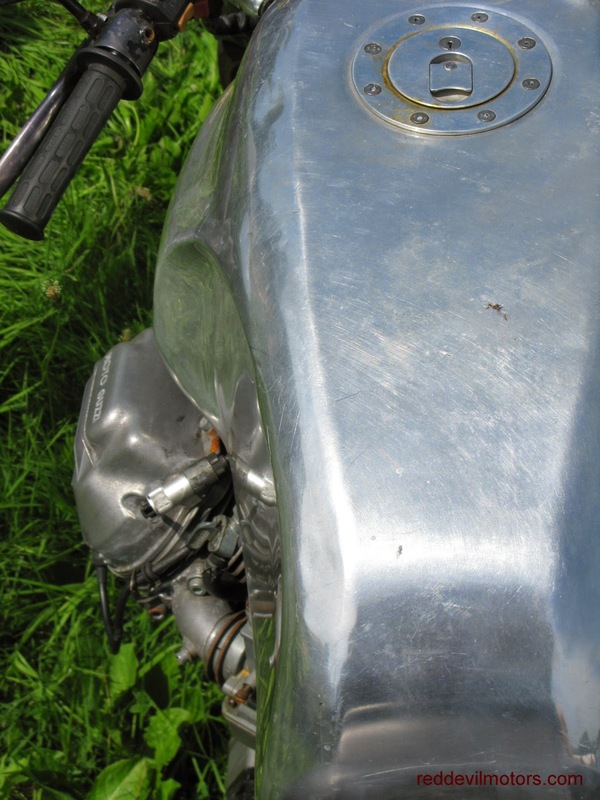 The otherwise awesome BMW R100RS has suffered from an incontinent petrol tap union since it came to me last year. 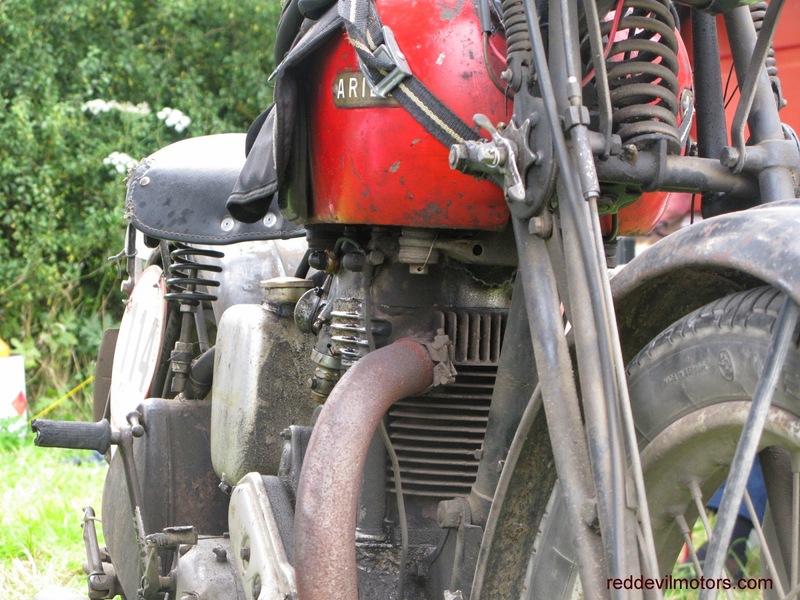 At first it was hard to diagnose even where the continual drip came from but eventually it was traced to dodgy threads on both the tap and petrol tank. For those who aren't familiar, BMW use a tap that has a large diameter internal thread attaching to the external on the petrol tank. 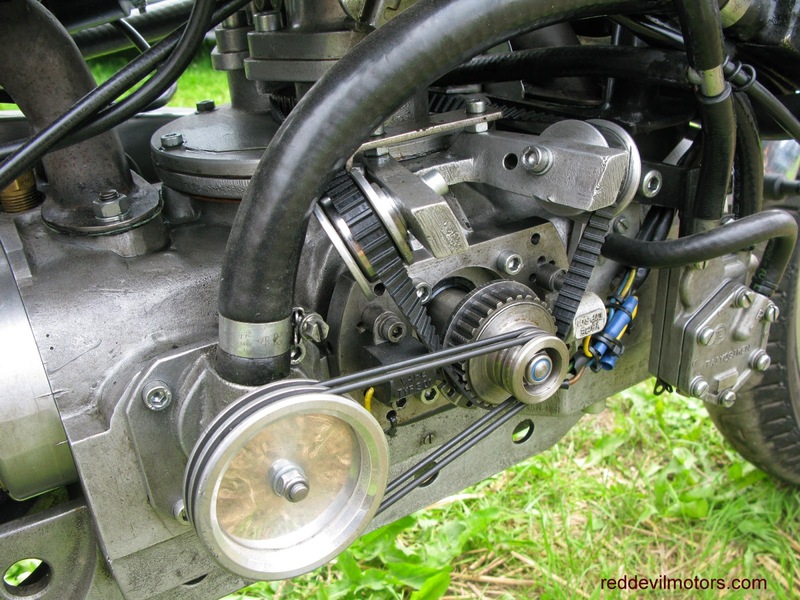 The thread pitch is fine and the whole set up is rather delicate, vulnerable to bodgery and cross threading. Mine had indeed suffered both these malaises over the years. Several unsuccessful attempts to fix had me searching on the net for a solution that didn't involve remedial repairs to the tank and a new tap. The best chance seemed to be a tube of Loctite 565. It's not cheap but I decided to give it a go and a few days later a tube dropped through the letterbox. It's a white paste that is designed as a thread sealant for fine threads, it is non-hardening and was apparently designed for refrigeration machinery. Everything I have read assures that it is petrol proof. 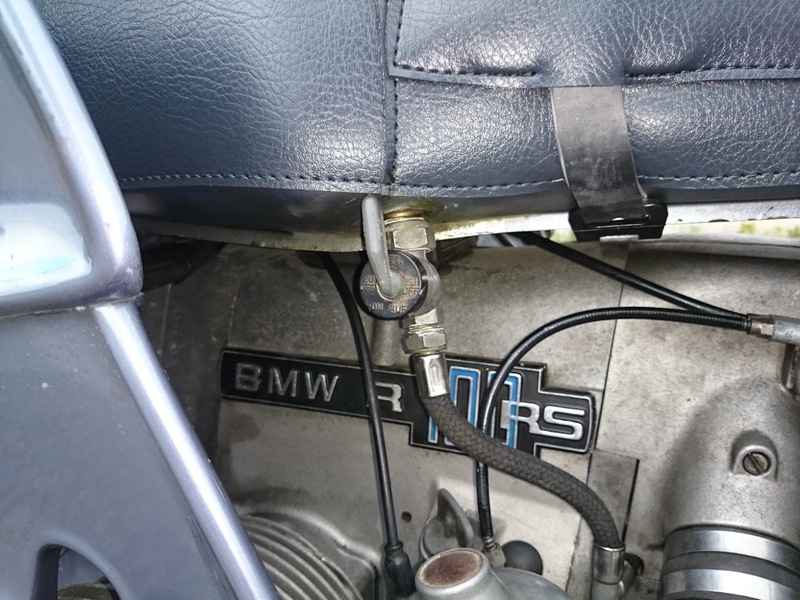 Leaky BMW petrol tap fixed. 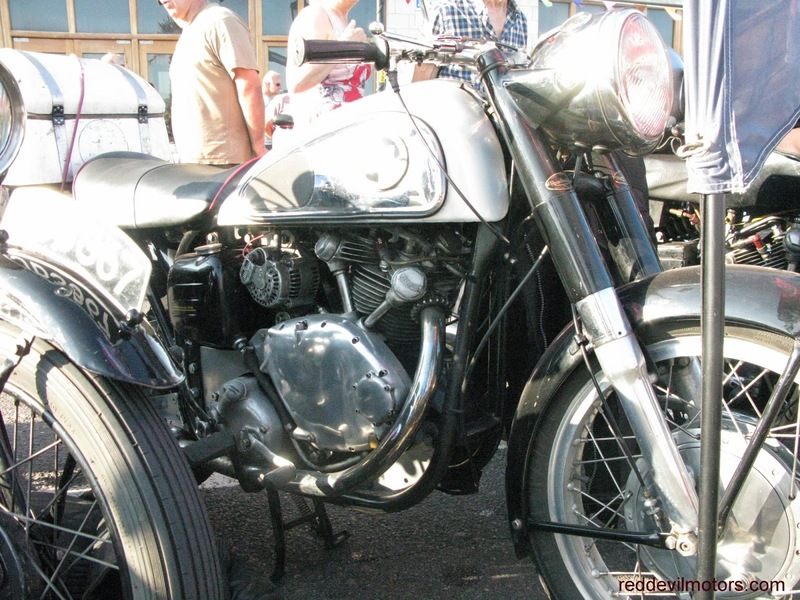 There's not much beats a summer evening rideout on a machine you have built up yourself. 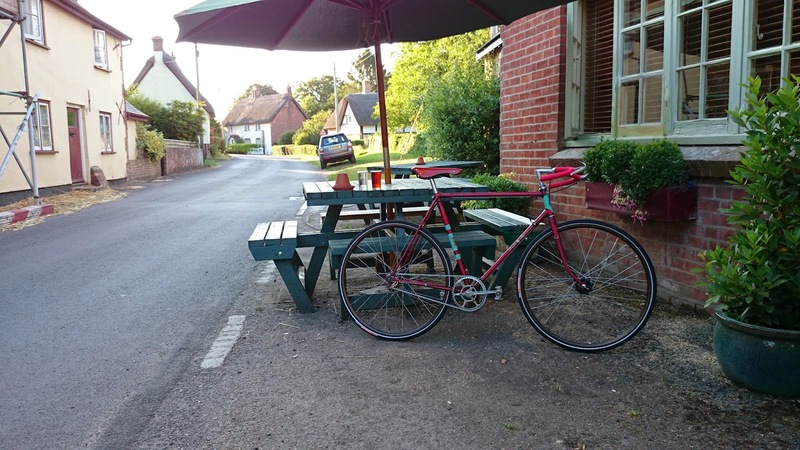 Here's the recently completed Elswick Lincoln Imp relaxing with a half of ale. Elswick Hopper Lincoln Imp at rest with ale. Lucky man has one of the finest machines of the day. 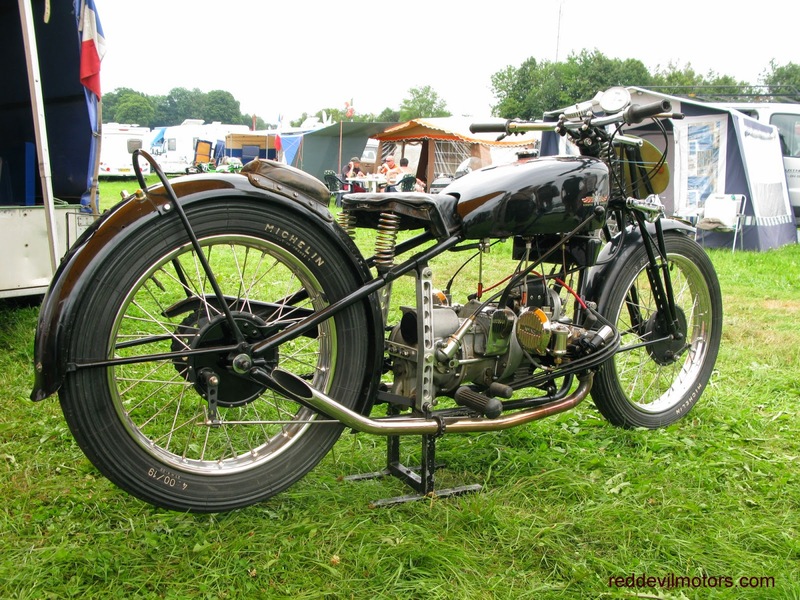 A JAP engined v-twin Zenith Gradua from (at a guess) 1918 or 1919. 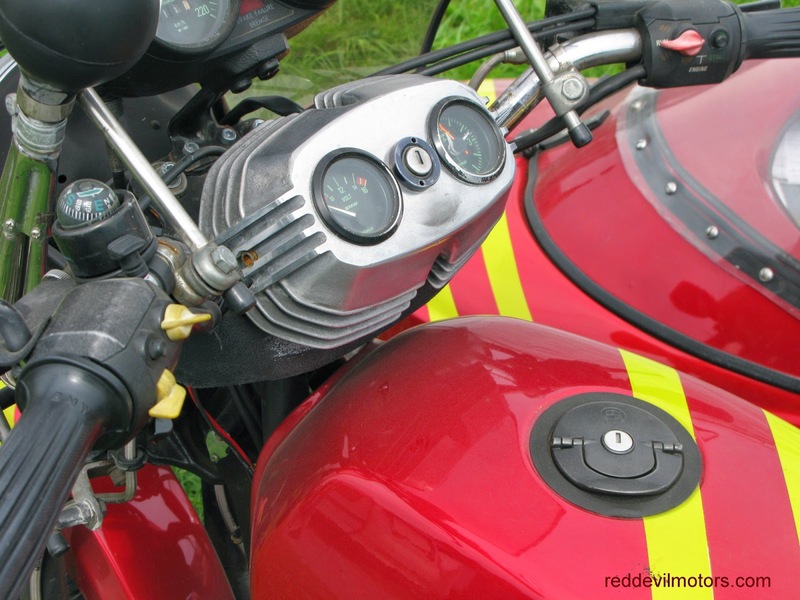 Took a while to identify the cycle but the unusual kick start mechanism is very distinctive as is the gradua gear pulley handle on top of the petrol tank. 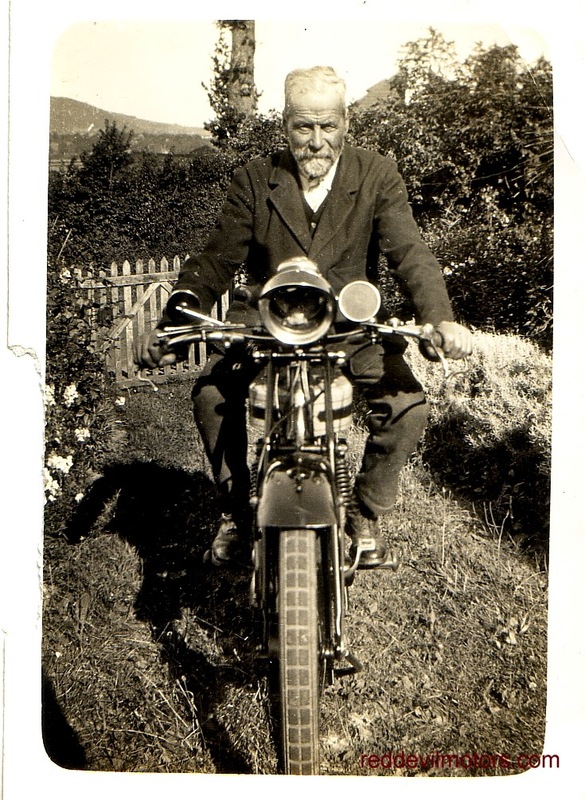 Chap looks happy with his civilianised ex-WD Triumph 3HW. 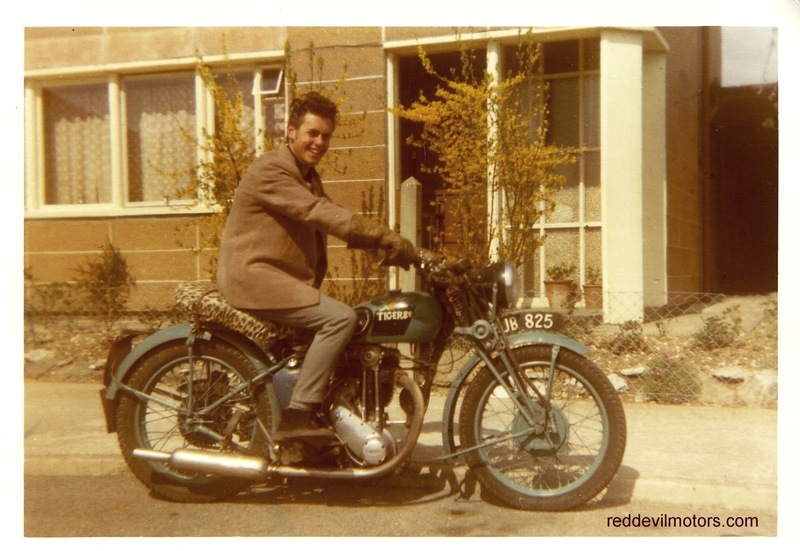 Cheapo ex-army bike modernised with leopard print dual seat represented motorcycling reality for many in postwar austerity Britain. Big leather gauntlets are the only concession to riding gear but the black suede 'brothel creeper' boots are a nice touch of style. 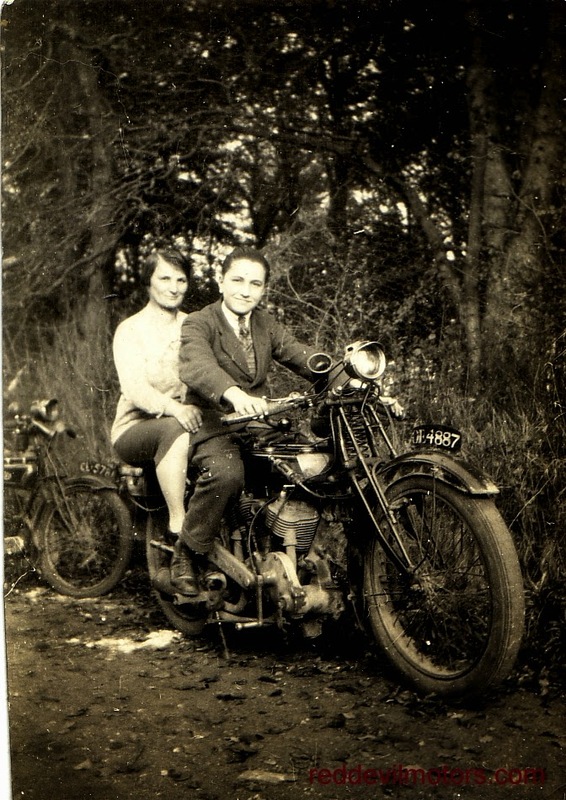 Judging by the number of old photos of twenties Triumphs around you could think that every other cycle back in the day was a Model P. Here's another, looks to be mid-twenties with a smartly turned out gent astride posing in an english country garden.